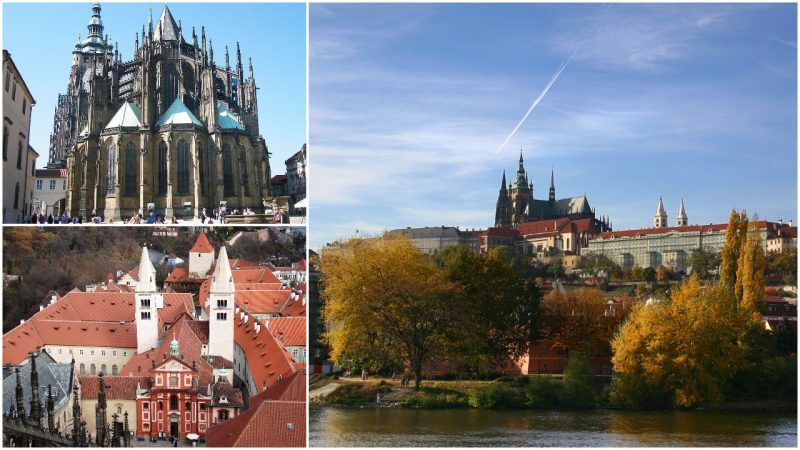 In the Czech capital city of Prague stands the largest castle in the world, according to the Guinness Book of World Records. Construction on the Baroque castle began in the year 870 and was ongoing until 1929. An entire complex lies within the surrounding walls. The first building, the Church of the Virgin Mary, was built by Prince Borivoj I sometime after 884. After an 11th-century fire, the church was rebuilt, but after it was extensively damaged in another fire in the 13th century it was abandoned and forgotten until excavations took place under the administration buildings on the site. Today the castle is still the residence of the president of the Czech Republic. 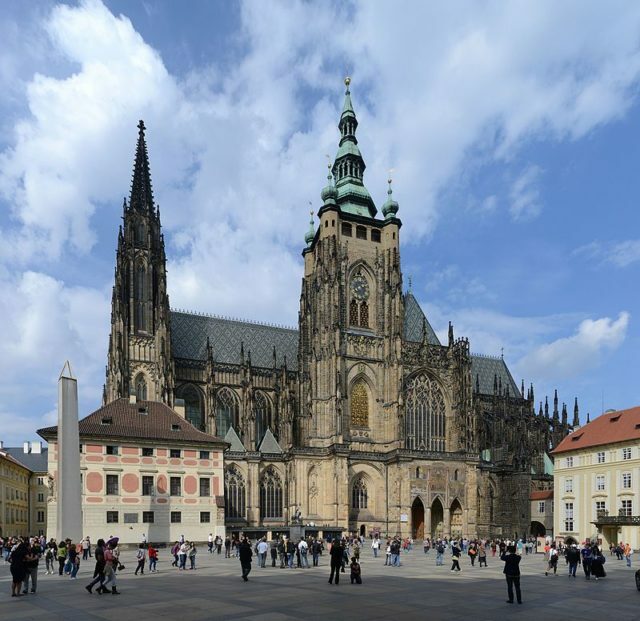 The Basilica of St. Vitus and the Basilica of St. George are also found within the castle walls; these were built during the reign of Vratislaus I, Duke of Bohemia from 915–921, and his son Wenceslas. The first convent in Bohemia, Benedictine St. George’s Abbey, was built in the castle in 973 next to the church of St. George. During the 12th century, a palace was built in the Romanesque style of architecture, which was popular in the 10th century and later morphed into the Gothic style. In the 1300s, during the reign of Charles IV, the royal palace was rebuilt in the Gothic style, and the fortifications of the castle were reinforced. A Gothic church was also erected, which took almost 600 years to complete. During the twenty-year Hussite Wars following the death of King Wenceslas, the castle sat abandoned, until 1485, when King Vladislaus II Jagello started to rebuild it. Vladislav Hall, a room large enough to host jousting tournaments, was added to the Royal Palace as well as a special staircase, known as the Knight’s Stairway, built wide enough to allow horses to pass through. After another fire in 1541 destroyed parts of the castle, additions were built in the Italian Renaissance style. King Ferdinand I built the Belvedere palace as a summer residence for his wife, Queen Anne, who unfortunately died in childbirth before it was completed. The Holy Roman Emperor from 1576 to 1612, Rudolph II, used Prague Castle as his primary residence. He ordered the construction of the Spanish Hall to display his collection of enormous statues. Rudolph II, a supporter of the Protestant church, was succeeded in 1611 by his younger brother Matthias. 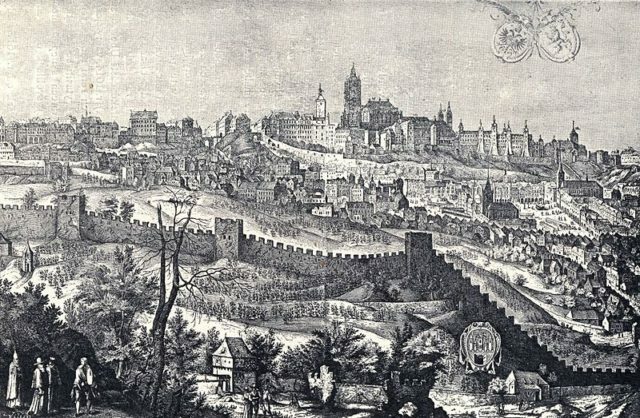 His support of Catholicism prompted the Bohemian Revolt, which ultimately led to the Thirty Years’ War, during which the castle was severely damaged. 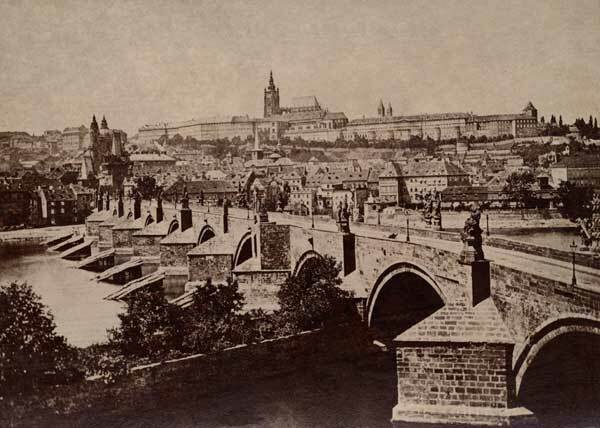 Much of Rudolph II’s collection was pillaged in 1648 during the Battle of Prague, the final conflict of the war. In 1918, the castle became the home of the president of the new Czechoslovakia, T.G. Masaryk. Slovenian architect Jože Plečnik modernized the palace and gardens. 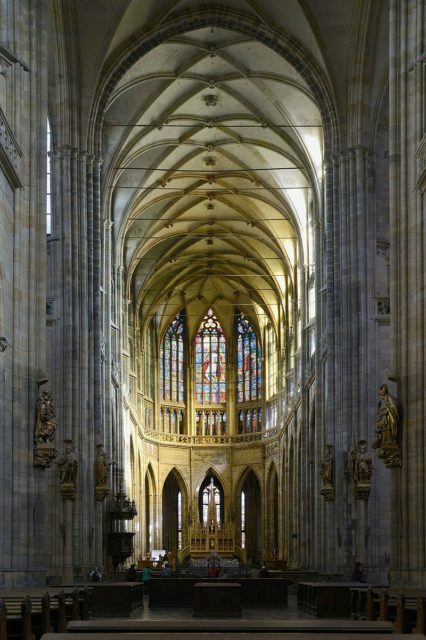 St. Vitus Cathedral was completed in 1929, and designer Pavel Janák continued renovations into 1936. 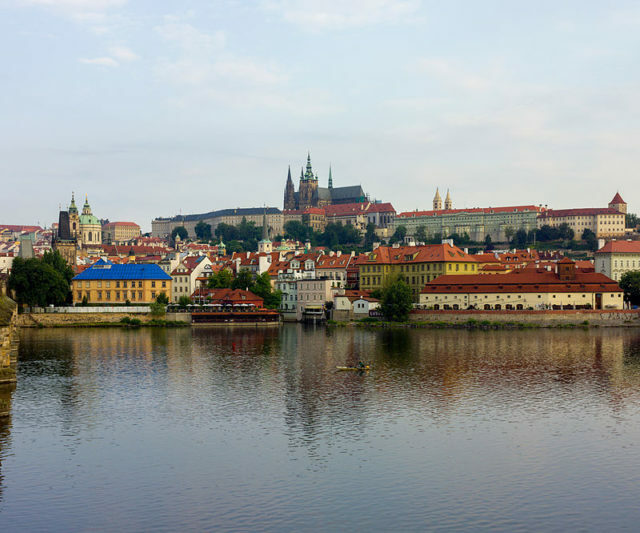 After the Nazis forced Czechoslovakian President Emil Hacha to turn the country over to the Germans, Adolf Hitler spent the night of March 15, 1939, in Prague Castle to tour the property he had stolen. During the Nazi occupation, Prague Castle became the headquarters of the Reich Protector of Bohemia and Moravia, Reinhard Heydrich. 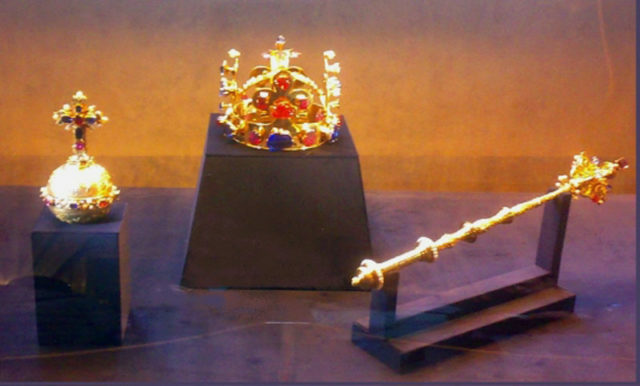 There is a legend that claims any usurper who places the Bohemian crown on his head will die within a year. Heydrich ignored this, and he placed the crown on his head. In less than a year Heydrich was attacked by Slovak and Czech soldiers during Operation Anthropoid and succumbed to his wounds within a week. The offices of the Communist Party were housed in the Castle from 1948 until 1993 when Czechoslovakia was divided into the Czech Republic and Slovakia. The castle became the home of the president of the Czech Republic, and President Václav Havel commissioned architect Bořek Šípek to tend to improvements, particularly the refurbishment of the gallery of paintings. Visitors today are welcome to tour much of the castle. Currently, the castle houses several museums, including the National Gallery collection of art and historical exhibitions, a toy museum, and remnants of the collection of Rudolph II. The Summer Shakespeare Festival is held annually in the courtyard of Burgrave Palace, and walking tours are available. According to TripAdvisor.com, a guided walking tour takes three and a half hours; a private guided tour of the castle at night runs about an hour and a half. There is also a tour of the town that takes about three hours.